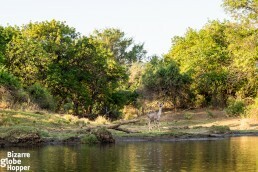 Canoe safari on the Zambezi offers the most serene version of “game drive” I can possibly imagine. 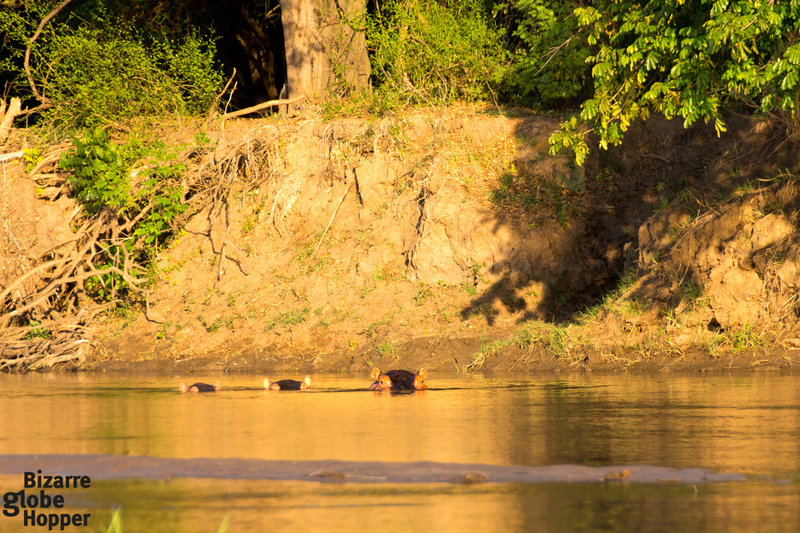 Floating silently pass animals gives an entirely different perspective to wildlife watching. Canoeing is unbelievably relaxing, yet thrilling experience since the distances to the animals might be minimal, and you don’t have the same kind of protection than in a car. 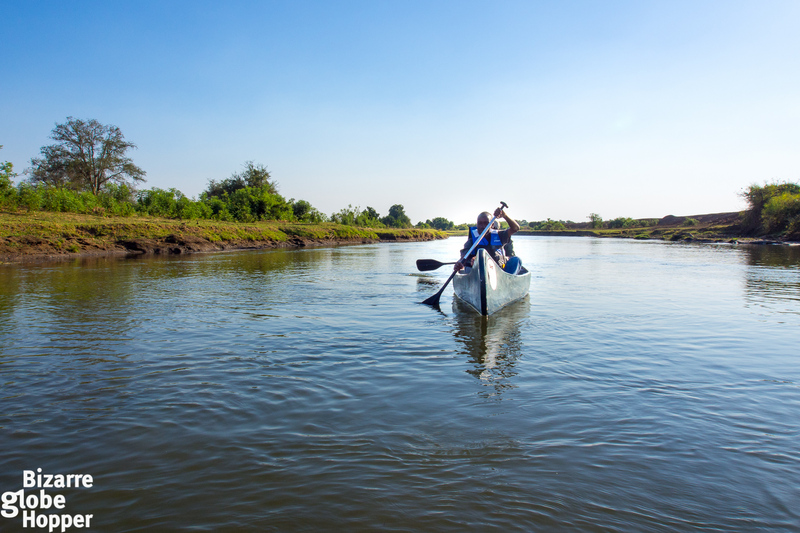 Canoeing is a slow means of transport for sure, so if you urge to see tons of wildlife in just a couple of hours, canoe safari might not be the best option. Nevertheless, during our canoe safari in Zambia, we managed to see a comprehensive palette of game similar to the standard game drive. The secret is to know where to paddle and which is the best timing to see animals who tend to come for a drink. 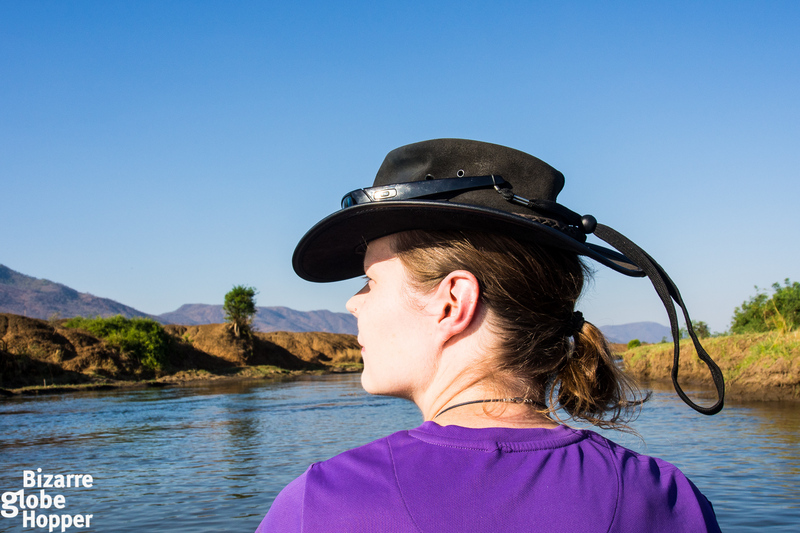 Our canoe safari took place in Lower Zambezi National Park, on the drastic Zambezi River. 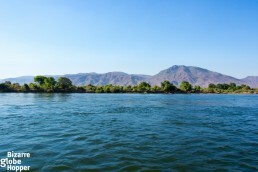 The Zambezi cuts land for more than 500 kilometers between Zambia and Zimbabwe. This 3500 km long river curls all the way from northern Zambia to the Indian Ocean passing also Angola and Mozambique on its way. We could actually see Zimbabwean shore while we were paddling, just like we saw it on our rafting trip as well. 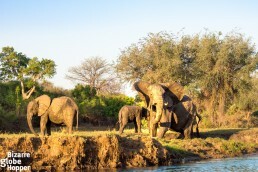 Most canoe safaris in Zambia, and likewise in Zimbabwe, are organized on the Zambezi River for obvious reasons. 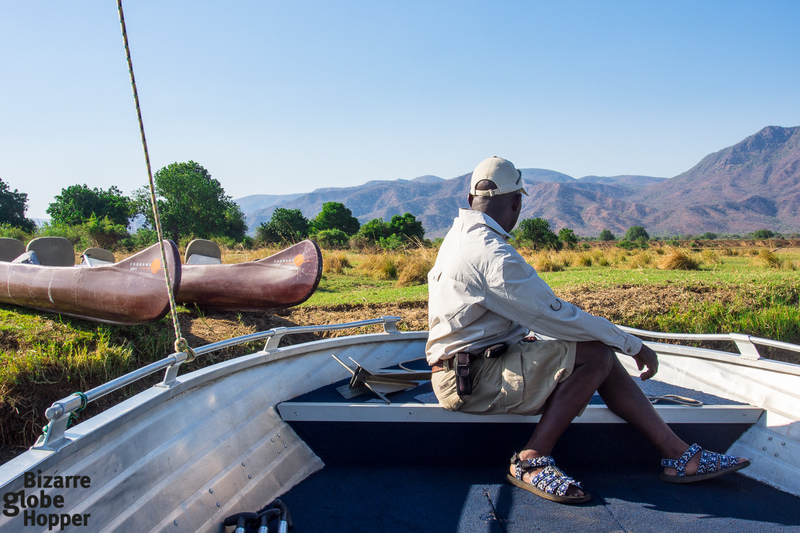 Since we were staying at the plush Royal Zambezi Lodge, we canoed down a nearby channel, accompanied by their guide. Calm and shallow waters of the channel make canoeing enjoyable and let you concentrate in wildlife spotting. You don’t even have to paddle since it’s just 6 km downstream, and your guide is paddling in the rear anyway. The stream will push you forward quite effortlessly without strenuous exercise. The subtle evening light softens the scenery. We are the observers taking notes on how baboons solve their domestic issues and sit by the sandbanks waiting for the sun to set – just like we humans do. Male elephants are trumpeting to show their muscles; crocs lie in a shallow water mouths wide open, waiting for the food to pour in. We are part of the scenery, but feel the animals’ eyes on us, as well. Switching from a motor boat to a canoe – so exciting! But what is there to be seen on a canoe safari, then? On top of the serene river scenery, we saw herds of impalas, some kudus and zebras, tons of elephants, cute tiny crocodiles, hippos plunging and splashing, and baboons playing and fighting. Then there were kingfishers, bee-eaters, hornbills, and tens of other bird species, whose names I regret to forget every time. 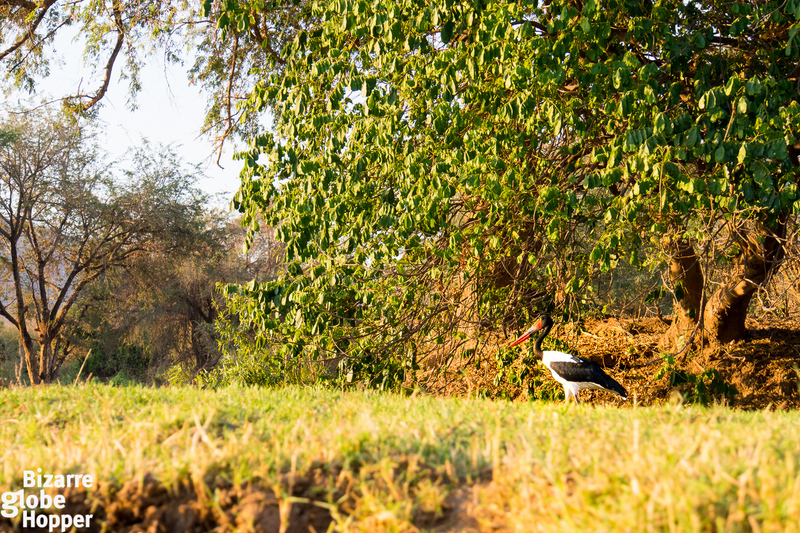 I had to ask our guide how many species he can identify, but the answer left me even more awestruck: more than 1000 birds, which all could be seen in the Lower Zambezi National Park. Every animal, except hippos, crocs, and birds, had wandered to the shore of the Zambezi on purpose: they needed an evening drink. Since we paddled down a channel that is only 10 to 15 meters wide, animals were close to us and appeared to approach us as they walked towards the water. Our guide paddled so quietly that the animals didn’t spook out at all and we could enjoy the sublime wildlife scenes. Canoe safari offers a new vantage point that makes seeing even the “typical safari animals” unique. Still, I’d say that the wildlife is not the main draw on a canoe safari, as weird as it might sound. The tranquil atmosphere took us by surprise, and the canoe made us merge in the environment. The subtle evening light came from behind us, softening the scenery. 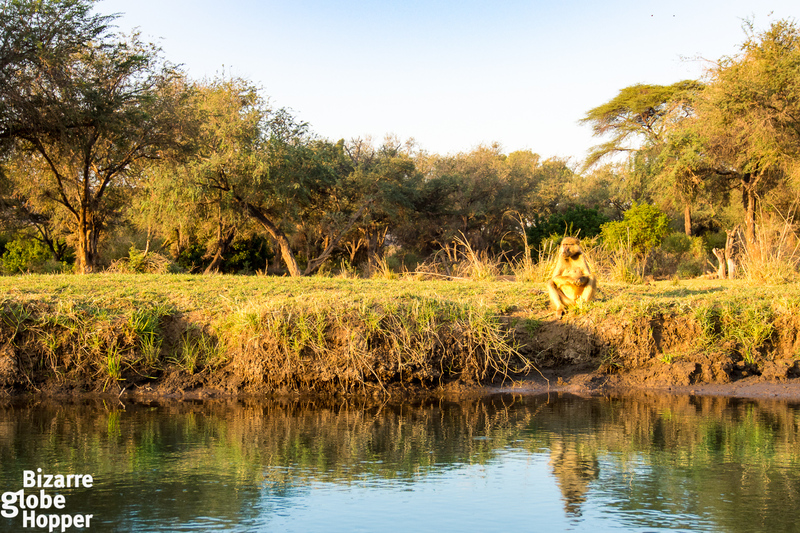 We were the observers taking notes on how baboons solved their domestic issues and sat by the sandbanks waiting for the sun to set – just like we humans do. Male elephants were trumpeting to show their muscles; crocs were just laying in a shallow water mouths wide open, waiting for the food to pour in. We were part of the scenery at that very moment, but felt the animals’ eyes on us, as well. 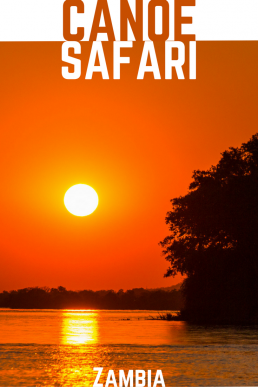 Is Canoe Safari on Zambezi Safe? On a canoe safari, there’s a just a tiny, flippery boat between you and the wildlife, so no-one can guarantee that nothing could happen. However, with a cautious behavior, you can avoid most of the dangers. Rule number one: avoid moving around in a canoe, sit still and make sure that you aren’t leaning too forcefully towards any direction. Keep your limbs inside the canoe since crocodiles are opportunistic eaters. If you fear water, wearing a life jacket might calm you, though it gets sweltering with one. Rule number two: respect hippos. When you confront a hippo during a canoe safari, give it enough space to either pass you or stay where it is. Never block the way, if a hippo is moving. Hippos are usually not aggressive if they aren’t agitated. But they will consider it a thread if you go too near or block their way – and then nobody knows what might happen. With these precautions in mind, you should be safe. We were drifting with our cameras in hand, but it’s a lot wiser to take a dry pack or cover your valuables otherwise during the canoe safari. I asked our guide if he had ever flipped the canoe with guests, and he nodded laughing. But it had only happened once after the guest had leaned carelessly to one side to take a picture. So take caution, unless you don’t want to get personal with hippos and crocs, or soak your equipment. 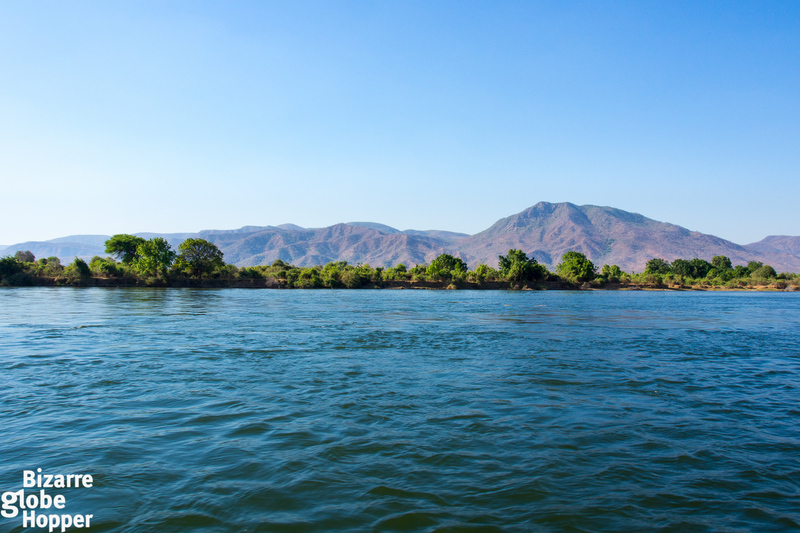 Where and When to Canoe on the Zambezi? 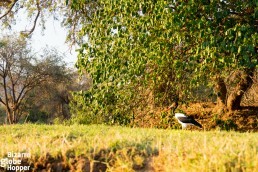 Many lodges in Lower Zambezi National Park organize canoe safaris in the same channel that we paddled. Nevertheless, we had the whole channel for ourselves and didn’t see any other canoes. Canoeing the 6-km stretch downstream (one way) took approximately one hour at a very leisure pace and constant stopping for photos. We had a motor boat transport from our lodge to the channel and witnessed an amazing sunset on our way back. 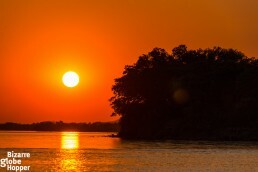 What a way to end a perfect afternoon on the Zambezi! 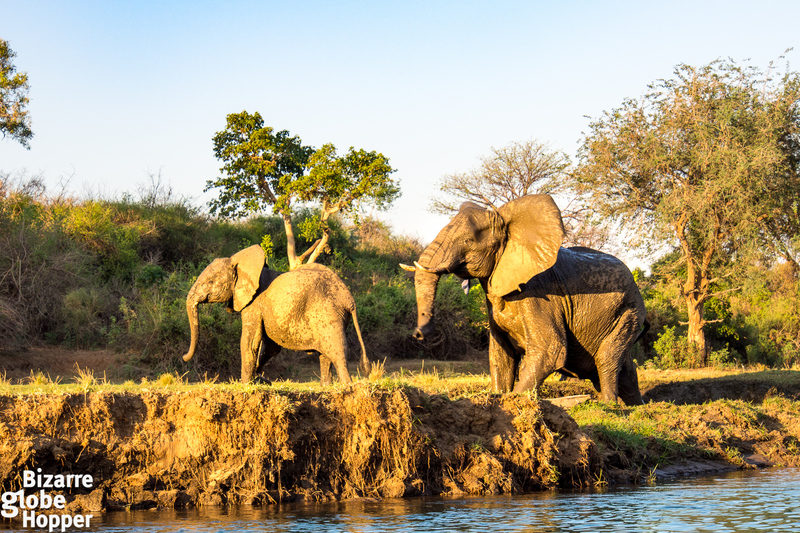 *Disclaimer: Royal Zambezi Lodge hosted our canoe safari, and we were touring Zambia with Zambian Traveller, but all opinions remain our own. 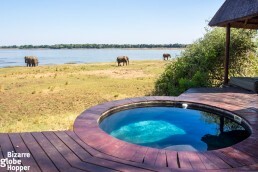 Which are the traits behind the best safari lodges in Zambia? Optimize wildlife watching opportunities, find the best guides and delight in lavish camps – smell out the hidden gems of Zambia! 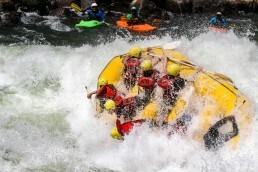 Can you go white water rafting at the Zambezi River when you're afraid of water? Yes, you definitely can. I did it and it was awesome. 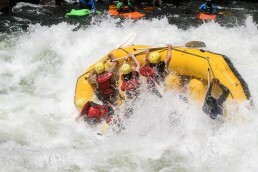 Watch our adrenalin-filled white water rafting adventure video on the raging Zambezi River in Zambia. Some grade 5 rapids here! Would you like to try tiger fishing on the Zambezi river? Try to catch this iconic fish, sip a cold beer, and watch the sunset of Africa. I am going to Zambia in September and I would really like to go canoeing down the zambezi. How did you find out about your guides before you went? Do you have any links for the websites that you used?